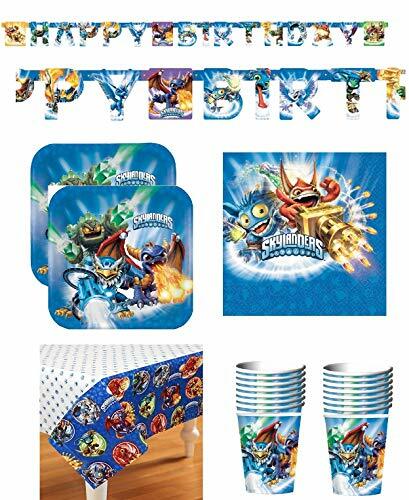 Skylanders Birthday Party Bundle for 16. 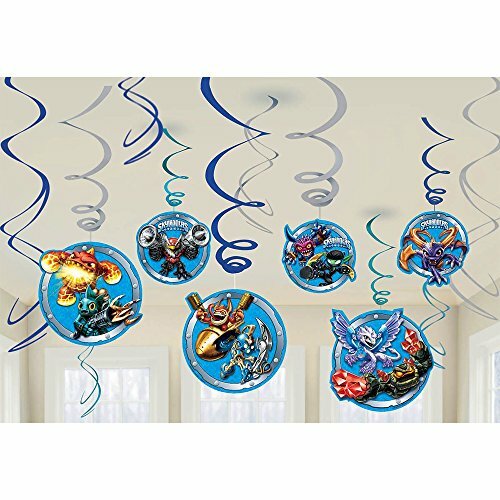 Make any party space feel like Skyland by decorating with this Skylanders birthday party banner. The banner measures 7.59 feet and features Skylanders characters, including Trigger Happy, Prism Beam, Jet-Vac, Double Trouble, Ignitor, Breeze, Spyro, Kastor, Wrecking Ball, Flash wing, Stealth Elf, Flames linger, Chop Chop, Eruptor, Cynder and Shroomboom. All guests are sure to find spot their favorite character in this Happy Birthday banner. Keep the magic going, get this Skylanders Party Game for your kids birthday party, and have hours of magical fun. 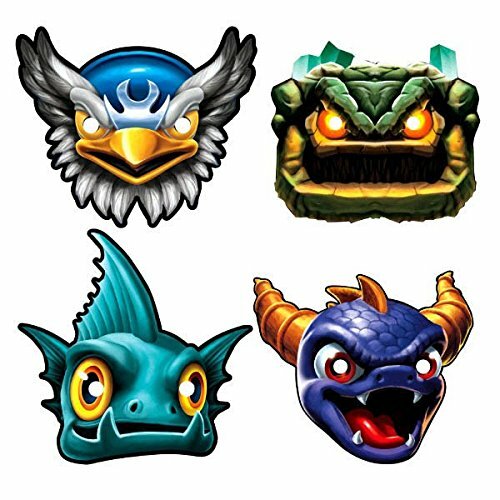 Travel to Skyland for your next Skylanders super fan's birthday party with these Skylanders character masks! Masks featuring Jet-Vac, Gill Grunt, Spyro and Prism Beam are included in the set, ensuring everyone will be proud to wear their favorite character's mask. The masks are held in place by an elastic string and are available in one size that fits most children. 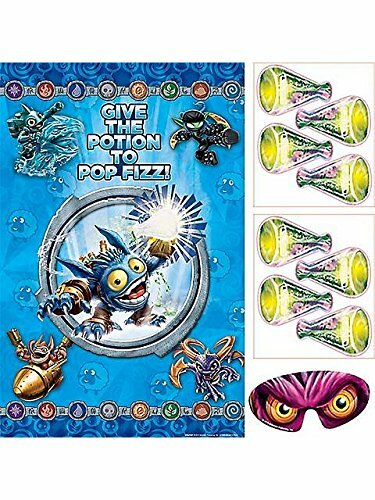 The Skylanders masks coordinate with other Skylanders-themed party supplies by American Greetings. Package includes Skylanders Swirl Value Pack to match your party theme.This is an officially licensed Skylanders product. 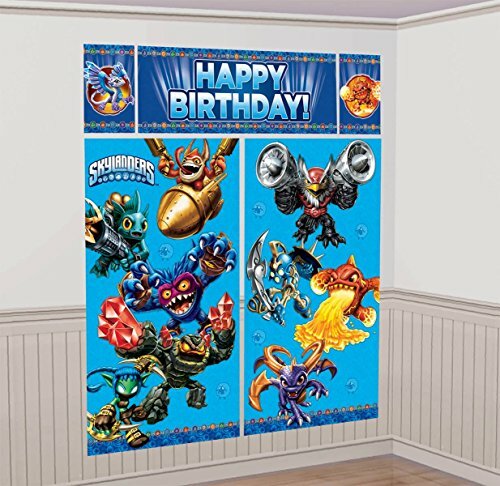 Cover the walls with your child's favorite Skylanders characters! This easily hangable wall decoration is a great way to transform any location into a festive environment. Birthday wishes are wrapped by a border of the Skylanders featured elements. 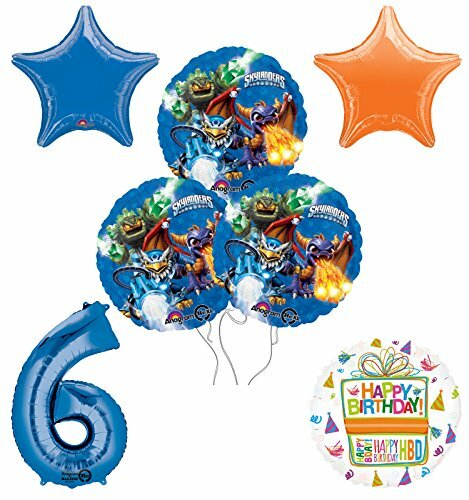 With this kit you will receive: (3) 17" Skylander Round Foil Balloons, (1) 18" Birthday Present Foil Balloon, (2) 19" Star Foil Balloons 1- Blue and 1- Orange and (1) 34" Giant Blue Number 6 Foil Balloon. Just add Helium and ENJOY! 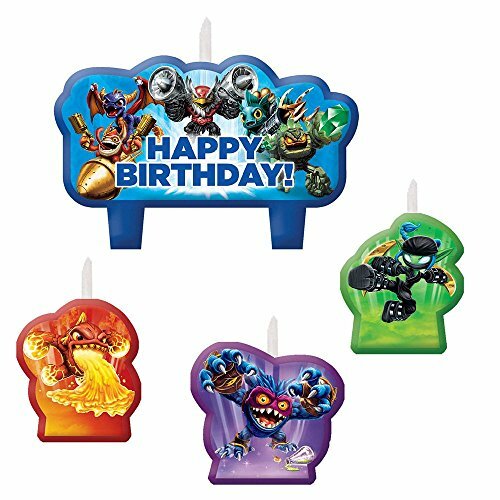 Your child's favorite Skylanders characters can be found on these fun character themed birthday candles! This four piece birthday candle set features a selection of some of the game's coolest characters. 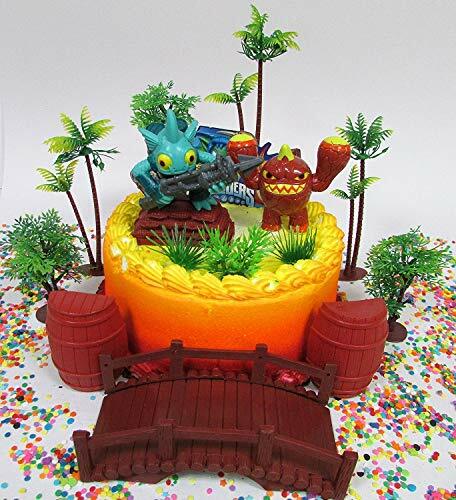 These Skylanders themed candles are a must have for any fan of the games! Get all the elements on your table. 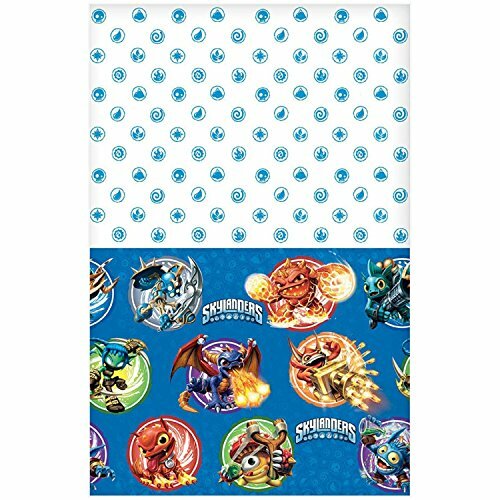 Get this Skylanders Birthday Party Plastic Table Cover to decorate your kid's birthday party table. 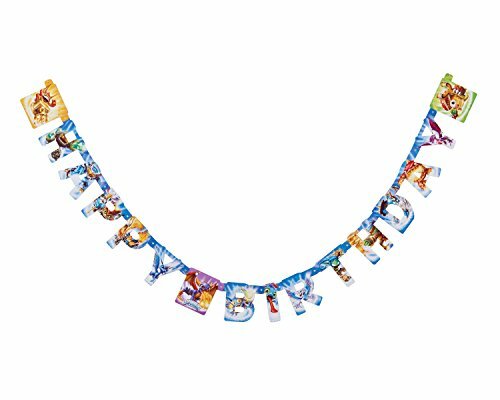 Combine magic and tech, decorate with this awesome Skylanders Happy Birthday Letter Banner, and just like magic just add the age. It's fire versus water when Eruptor and Gill Grunt face off in an epic battle in this cake topper! Deco Set includes an Eruptor figurine, a Gill Grunt figurine, and a character placard. 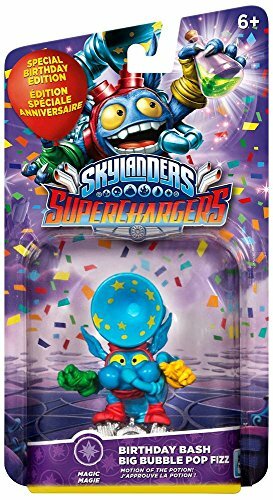 Skylanders stickers party favors pack. Set of 2 sticker party packs. Each pack has 8 sheets of stickers, for a total of 16 individual sheets. 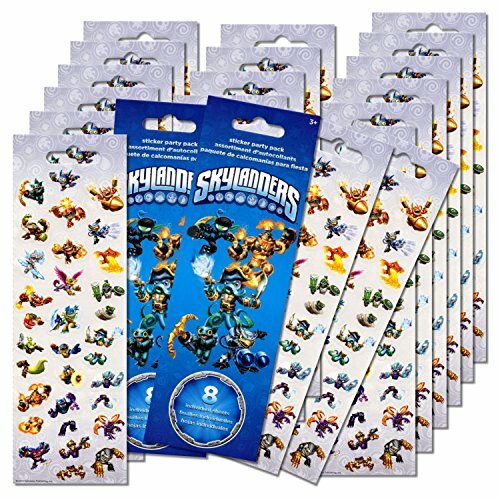 Each sticker pack has over 96 quality stickers; for a total of more than 190 Skylanders stickers. This sticker set is great for party favors, rewards, and more! Great fun for any Skylanders enthusiast! 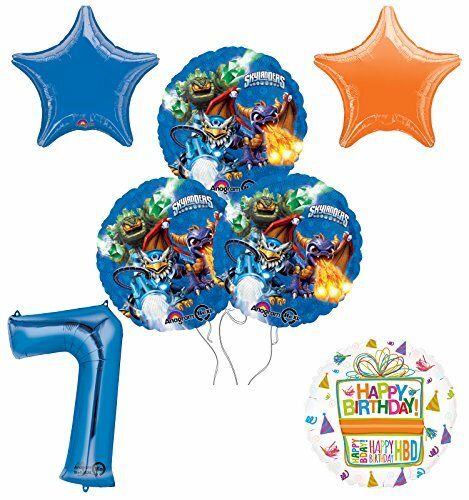 With this kit you will receive: (3) 17" Skylander Round Foil Balloons, (1) 18" Birthday Present Foil Balloon, (2) 19" Star Foil Balloons 1- Blue and 1- Orange and (1) 34" Giant Blue Number 7 Foil Balloon. Just add Helium and ENJOY!